Shanghai Tea House is located inside Burnside Village, and is both a Chinese restaurant and yum cha place rolled into one. The place has a modern exterior with traditional elements inside. The decor is not specifically traditional Chinese, but more of a fusion of other Asian elements. The seating cubicles that they have on one side are more Japanese than Chinese. We came here as a group for yum cha. When you enter the restaurant, you’ll be handed a normal menu and a drinks menu. 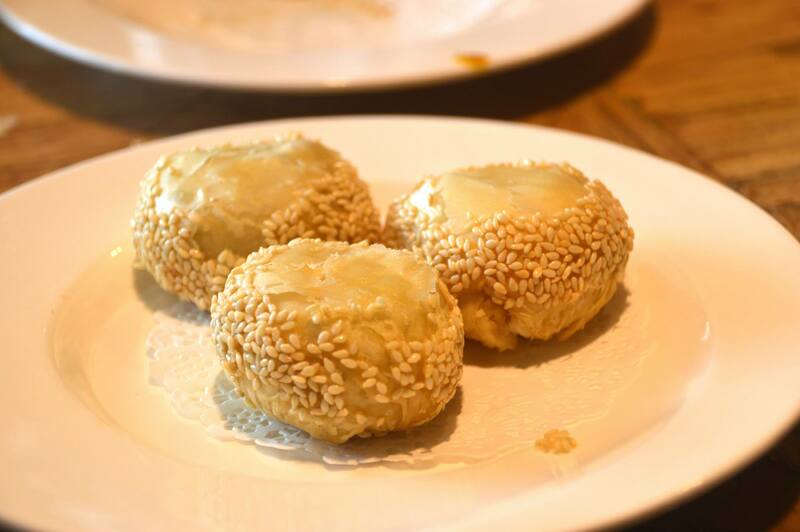 If you want yum cha, you’ll have to specifically ask for it. I felt the tables here are a bit small. The seats seem to be too close together and it was difficult to get in and out. The yum cha menu has limited items, and instead of somebody coming around with a food trolley, everything is made to order. There is also no complimentary tea, unlike every other yum cha place. Today, the group ordered a range of yum cha dishes to share. The food came out 15 minutes after ordering and everything came out at the same time. SESAME PANCAKE – Light and crispy pastry shell. Nice and savoury, but more of a snack than anything. SATAY CHICKEN SKEWER – Chicken was tender and succulent. Chicken breast was used which is great for the health conscious. A smooth peanut butter was used in the making of the sauce, which had good flavour. PRAWN AND CHICKEN DUMPLING – Small single bite sized pieces of bland dumpling. You really need to make use of the chili soy sauce or hot chili paste to actually enjoy this. 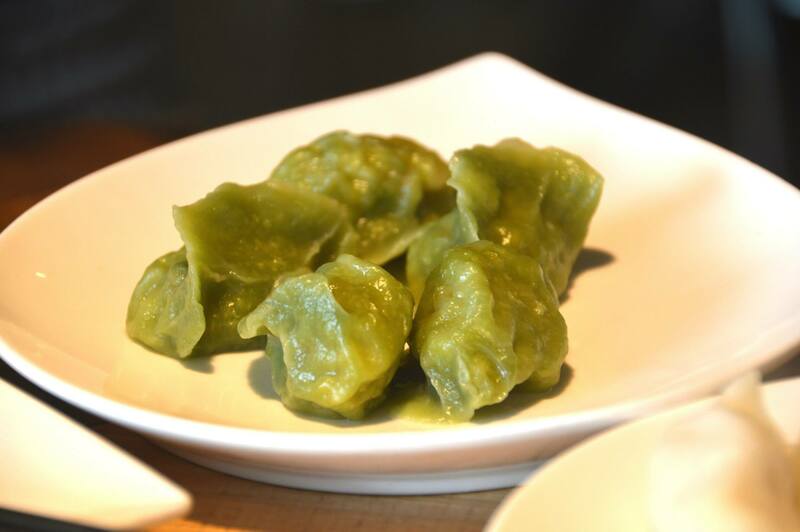 VEGETABLE DUMPLING – Small single bite sized pieces of dumpling. The filling was very tasty and was probably one of the highlights of this meal. BBQ PORK PASTRY – Pork was tender and well marinated. It was wrapped in a soft delicate pastry. Different to the triangular shaped portions that I’m used to, but not bad. PRAWN CORIANDER DUMPLING – Filling was perfectly cooked and the dumpling skin wasn’t too thick. Needed to dip this into the provided condiments to make it taste better. SCALLOP DUMPLING – Scallops were succulent and juicy. Dumpling skin was of a nice thickness. Needed condiments to add a bit of flavour. DIM SIM – Classic Chinese takeaway dish. Filling was well marinated and perfectly cooked. Could have been eaten on its own. KING PRAWN DUMPLING – I suspect these dumplings were bought premed. They were well cooked though. PORK DUMPLING – Pork was tender and juicy. Liquids were retained inside the dumpling which is how it should be. Dumpling skin was of a nice thickness. A few friends decided to order their own pots of tea. The pots were made of beautiful translucent glass and came with cute little plastic tea cups. A tea pot of tea is made up of 20 small cups, and it certainly takes a while for a person to drink it all. It was quite humorous as we waited for the people to finish drinking their tea. The staff were friendly, but at times were inattentive. The atmosphere was relaxed and the experience was OK. The pricing is average and about what I usually pay when I have yum cha. I think their limited yum cha menu was one of the major downfalls in this case.